Terex Port Solutions (TPS) will supply the Brazilian fertilizer manufacturer Yara Brasil Fertilizantes S.A. (Yara) with a system solution for unloading raw materials for fertilizer manufacture. Two Terex® Gottwald Model 6 portal harbour cranes in the G HSK 6448 B four-rope-grab variant and two Terex® HSH 1200 DS hoppers will start work in April and May 2015 on an existing factory pier in Rio Grande (southern Brazil). They will operate in pairs consisting of one of each device for simultaneous handling on two bulk ships up to the Panama class. The two Terex Gottwald G HSK 6448 B portal harbour cranes for Yara, derived from the mobile harbour crane, with four-rope- grabs are equipped with portals for a track gauge of 10m and a clearance height of 7m. The permissible rail loading of 22t/m requires a total of 48 wheels (12 wheels per crane corner), which also represents an innovation for TPS after previous designs had a maximum of 32 wheels. The cranes, which feature a maximum lifting capacity of 100t, a radius of up to 51m and a powerful 50t grab curve, obtain their drive energy from the external power supply system on the pier. The two Terex HSH 1200 DS hoppers have a capacity of 1,200tph (tonnes per hour) and run on the same pair of rails as the two portal harbour cranes, with which they are each connected via coupling rods. Thus, the hoppers do not require drive units of their own. The units, which are equipped with four pairs of wheels and a total of 16 individual wheels, have an effective dust protection system, which virtually eliminates any spilling. This also prevents raw fertilizer material being deposited on the cargo handling systems and initiating or accelerating the corrosion processes. TEREX PORT SOLUTIONS AS A PROVIDER OF INTEGRATED SYSTEMS FOR BULK MATERIAL Terex Port Solutions is highly experienced in developing and constructing machinery for handling bulk material. 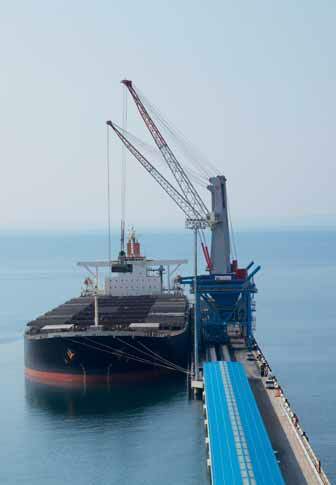 Based on its mobile harbour crane technology,TPS has successively developed various crane types, from portal harbor cranes to floating cranes on barges, and integrated them into numerous terminal structures. TPS responds to customers’ needs in the global bulk market with an integrated strategy. Not only have new crane types been developed, but the product portfolio is enhanced to include complementary equipment such as hoppers. Terex Port Solutions can also provide bulk material terminals with terminal management software to help increase productivity. Terex Corporation is a diversified global manufacturer of a broad range of equipment that is focused on delivering reliable, customer-driven solutions for many applications, including the construction, infrastructure, shipping, transport, quarrying, mining, refining, energy, utility and manufacturing industries. Terex reports in five business segments:AerialWork Platforms; Construction; Cranes; Material Handling & Port Solutions; and Materials Processing.Terex offers a complete line of financial products and services to assist in the acquisition of Terex equipment through Terex Financial Services.